Lombard Police Officer Dan Herrera responded to a call of a car on the railroad tracks at the intersection of St. Charles Road and Grace Street in Lombard, at approximately 8:15 on the evening of Jan. 14. Herrera was close to the location and was on scene within two minutes of the original call. Upon arriving, Herrera identified the vehicle on the tracks and two citizens who had left their own vehicles to assist the driver. The driver, Antoinette Lazarra, 96, of Burr Ridge, had been reported missing earlier that morning by her family. She was driving a 2006 Lincoln Zephyr eastbound on St. Charles, attempting to make a right hand turn on Grace Street, when she lost control of her vehicle and drove onto the tracks. Stephen Spapperi, 19, of Lombard, was driving northbound on Grace Street, approaching the intersection, when he observed a car lose control and drive eastbound onto the railroad tracks. Justin Mueller, 24, of Lombard, was driving behind Spapperi and also observed the car drive onto the tracks and get stuck. Both citizens exited their vehicles to assist the driver before police arrived. Herrera, along with Spapperi and Mueller, assisted Lazarra out of her vehicle and off of the tracks. 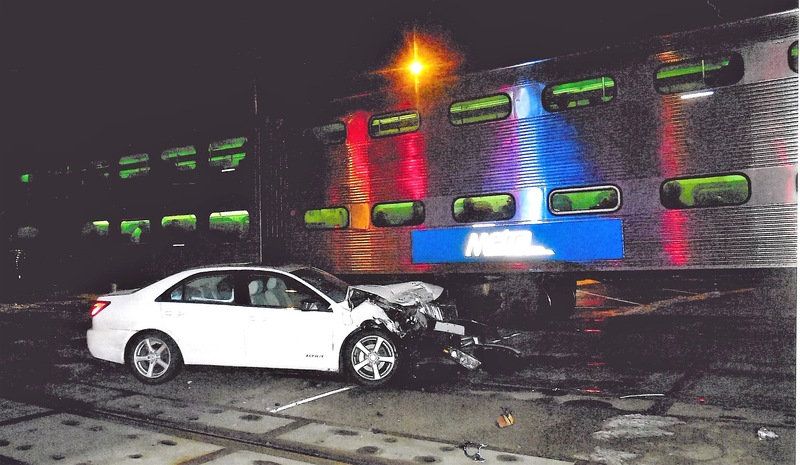 Shortly after that time, Metra Train #134, traveling westbound on the tracks, collided with Lazarra’s vehicle. The driver of the vehicle was treated at the scene by Lombard paramedic/firefighters. She appeared disoriented and was transported to Good Samaritan Hospital for tests and observation. “It’s nice to know that we still have people that act when others are in need,” said Lombard Police Chief Roy Newton. “I truly believe that they helped save a life this day.